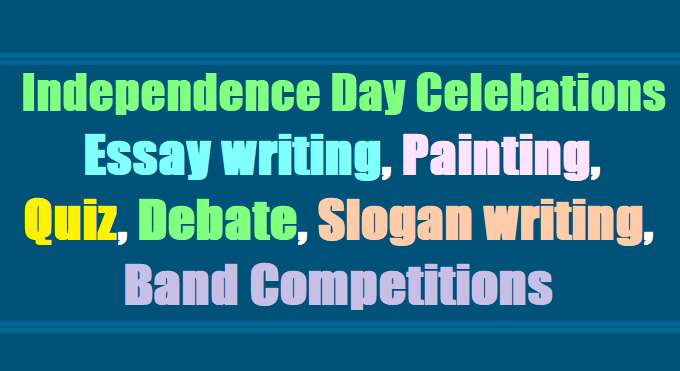 Independence day Competitions 2017- Independence day Essay writing, Painting, Quiz, Debate, Slogan writing Competitions 2017: This year the nation is completing 70 years of independence on 15th August, 2017. Cultural festivals, Band Competitions, Patriotic programmes, Essay /Quiz/Debate competitions, Slogan writing competitions, Painting Competitions and other related participatory activities should be conducted from 8th to 15th August in the run-up to the Independence Day. In this connection, besides the regular programmes organised by the State/District authorities, it is desirable that additional activities may be undertaken during Independence Day Celebrations, 2017 with the objective to create festive and patriotic mood across the nation and for stronger involvement and participation of the general public in the Independence Day Celebrations. i) Patriotic programmes: Arranging patriotic programmes and giving exposure to children for national integrity and the struggle and sacrifices of the independence movement. ii) Essay /Quiz/Debate competitions: Essay /Quiz/Debate competitions may be organised for students on the theme of struggle for independence. iii) Slogan writing competitions: Patriotic slogan writing competitions. iv) Meetings: Holding meetings of School Management Committees (SMCs)/Parent Teacher Associations (PTAs) on the themes of patriotism, Contribution of the community and society in nation building. v) Prabhat Pheris: Organising of Prabhat Pheris by students, with patriotic slogans and banners. vi) Painting Competitions: Painting Competition for students on various themes of 70 years independence. vii) Band Competitions: School Band Competitions and band displays at sub-division/District level, P.T., parade, march past may be carried out after morning assembly. viii) Periodic films: Showing periodic films on the journey of India's progress from independence period to present era, life stories of freedom fighters, scientists, etc. ix) Unity and Swachhta pledge: Taking unity and Swachhta pledge by students and teachers. x) Cultural festivals: Organising cultural festivals including dance, drama and other cultural activities on India's independence struggle, including role play by children. It is accordingly requested to take necessary action and issue necessary instructions to district authorities, the schools/ educational institutions, so as to ensure whole hearted participation of students, teachers, parents, local people and representatives etc. in this National festival. An activity report in this regard may be furnished to this department by 20th August, 2017. Cultural festivals, Band Competitions, Patriotic programmes, Essay /Quiz/Debate competitions, Slogan writing competitions, Painting Competitions and other related participatory activities should be conducted from 8th to 15th August in the run-up to the Independence Day.